Creative questionnaires work great to engage and build your audiences these days. By building authentic, playful and personal interactions with your respondents (in the shape of a quiz, a calculator, an interactive form, …) you will get more valuable data and insights in return. So how come, when we take the time to build these lead-generating questionnaires, only 30% of collected leads get followed up? A big hurdle in survey software is that it often takes a bit of time to get the collected data analyzed, sorted and then imported into the right marketing tools you’re using. Lucky for us, there are easy integrations that will do that work for us! In this article, you’ll find all the steps needed to set up such an integration. 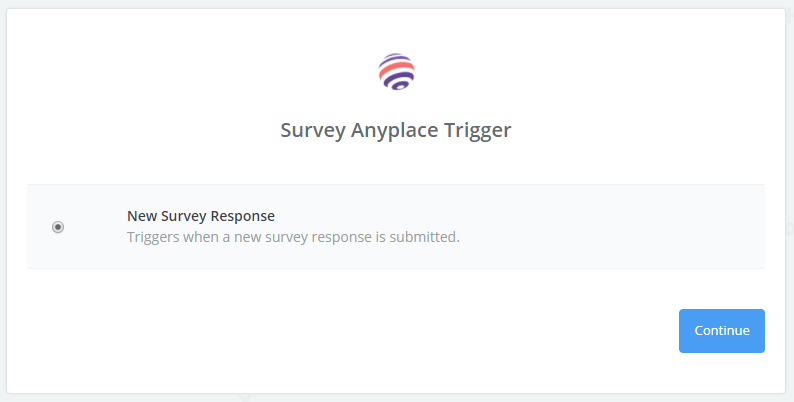 The connection between ActiveDEMAND and Survey Anyplace is set up through Zapier, great for one-way data pushes! Zapier is a trigger-based app that, as soon as a new trigger is logged, it will push all the necessary data to the connected database. In this case: As soon as a survey response is saved, it is automatically added to your ActiveDEMAND contacts list. Setting up the connection between both apps requires you to have an account on both ActiveDEMAND, Survey Anyplace and Zapier as well. As soon as those are up and running, you are good to go! First, if you haven’t done this yet, you’ll have to create your survey (log in to Survey Anyplace here), as the URL of the survey will be the identifier to set up your “Zap”. Based on the number of questions you ask your respondent, you’ll be able to enrich your contact with all kinds of additional data (location, employer, company, …). 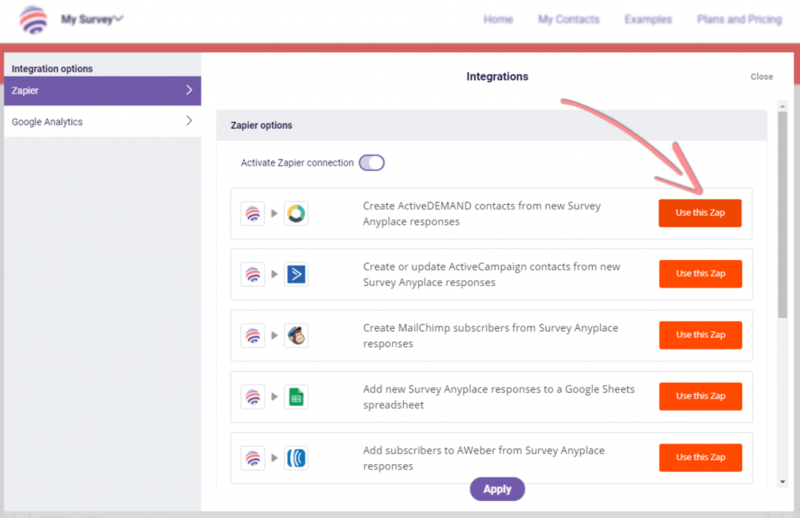 Within the integrations section of your survey, you’ll find the Zap-template for ActiveDEMAND already waiting for you! 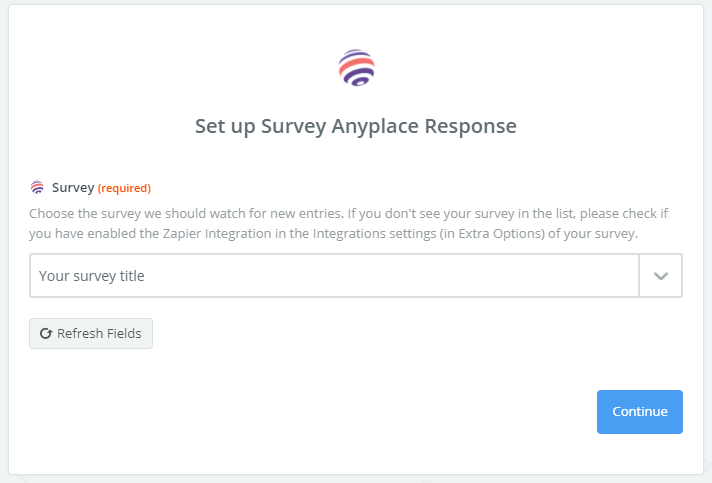 Clicking the template will lead you directly to this editor page in Zapier where you can set up the specifics for your connection between Survey Anyplace and ActiveDEMAND. First up is selecting your trigger… Not a too difficult a choice 🙂 It’s a survey response. Connect the right survey: The titles of your surveys will appear in a handy drop-down menu. (And make sure that you have at least one recent response entered so that Zapier can test the connection!). And step one of your Zap is completed! The second part of the integration requires some information coming from ActiveDEMAND. The action here is again easy to choose: “Create a new contact”. 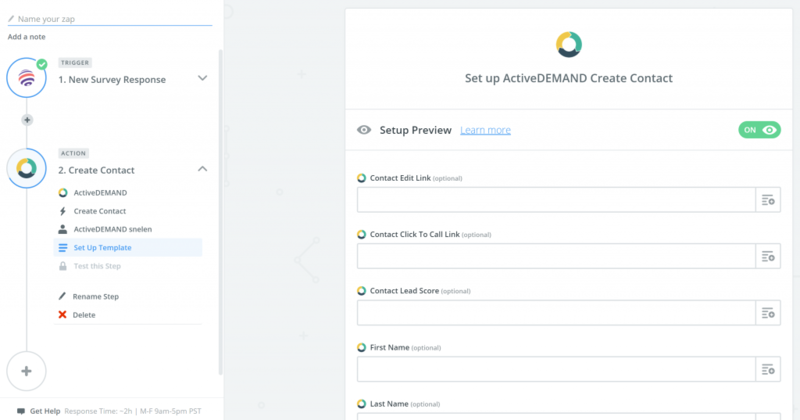 Connect your ActiveDEMAND account and start setting up the template of what data you wish to import from Survey Anyplace. 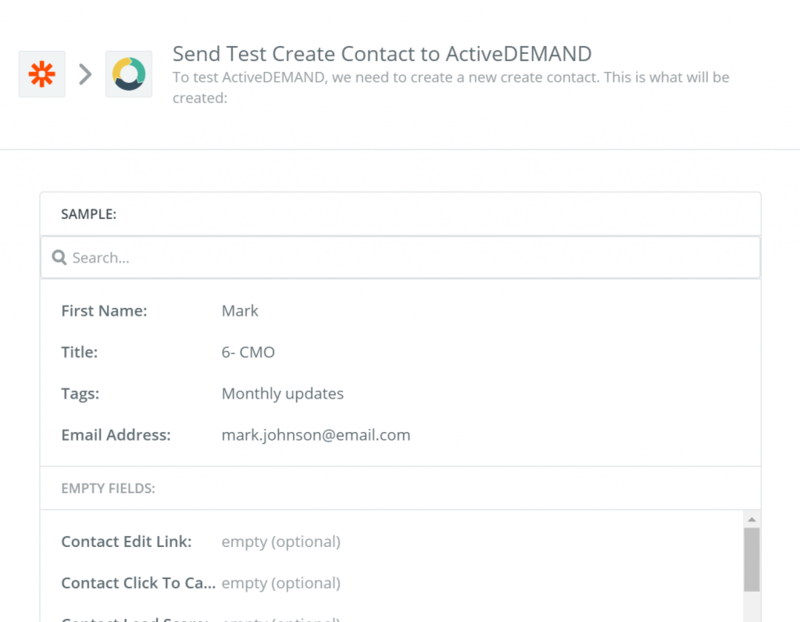 If you’ve been working with ActiveDEMAND before, you’ll know how many extra pieces of information you can attach to a single contact. All from a single survey response! 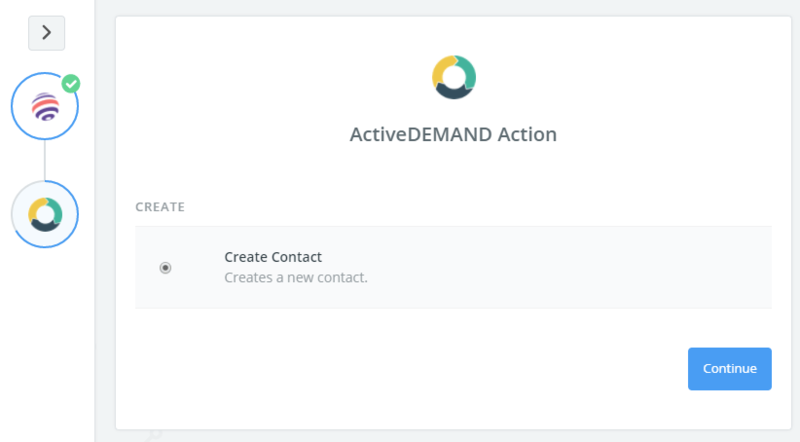 If we log in to our ActiveDEMAND account to see what the result looks like, you’ll find new responses neatly listed in your contacts. It will not only allow you to build your email list. But it’s also a great way to enrich your user data with new survey responses. The integration can help you register preferences based on given answers to build even more personalized email marketing campaigns. This integrated marketing platform is built to make your online marketing easier. ActiveDEMAND enables businesses to manage their email marketing, marketing contact databases and social media marketing, all in one tool. With a survey maker like Survey Anyplace you can say goodbye to boring surveys. The questionnaire tool allows you to build interactive, enticing surveys, quizzes and assessments or forms that will get you better data in return.